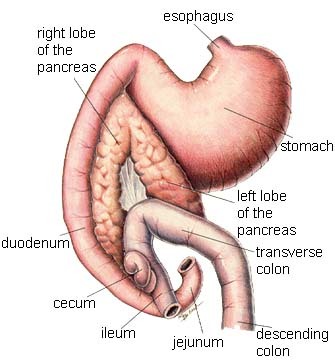 The pancreas is a small, spongy, gland attached to the upper intestines just below the stomach. Some of the cells in the pancreas produce insulin and when something goes wrong with these insulin producing cells, the result is diabetes. 1. Infection or inflammation: we call this pancreatitis. 2. Pancreatic cells that simply don't produce the digestive enzymes like they're supposed to: we call this exocrine pancreatic insuffiency. 3. Cancer of the pancreas: We call this terrible disease pancreatic cancer. This page is about the diets and supplements we recommend to treat pancreatitis and pancreatic insuffiency. -obesity, cancer, infection, steroid use, certain medications, and adrenal gland disease are all possible underlying causes. -certain breeds like Miniature Schnauzers are more prone than others breed to get this disease so there's probably a genetic factor. -cats are not prone to this disease. But people are and all the same underlying factors are important; over eating, obesity, lack of exercise, high fat diet etc. Symptoms include abdominal pain, vomiting, depression, weakness, dehydration, vascular irritation, rapid heart and respiratory rates. GI upset, and lack of appetite. Basically the patient just feel terrible. I tell my students; if you can't find anything else specifically wrong in an obviously sick patient... start thinking about pancreatitis. Diagnosis: We make a diagnosis of pancreatitis based on lab tests and radiographs. Pancreatitis is a complicated disease. It can be acute and happen once in a dog's lifetime or it can become chronic. It can cause rapid death due to the side effects or consist of only a mild pain that resolves in a few days. Side effects include shock, blood clotting problems, and heart, liver, and kidney disease. Treatment: This varies but involves controlling all the side effects of the disease to include pain, dehydration, vomiting,blood clotting, shock, etc. Severe cases will need hospitalization, IV Fluids, and parental antibiotics. They will need medication to control nausea. I like to also give activated charcoal to coat the upper intestines and reduce inflammation and absorb toxins. Restricting food for 2 days helps. This is a case where giving special treats rich in fat or sugar trying to get your pet to eat does harm. Antibiotics: because the pancreas is exposed to the bacteria in the intestines, an unhealthy pancreas is often infected as well. Prescription high fiber, low carb diets and weight control are the mainstay for long term treatment. The diet we recommend for initial treatment is Hill's I/D Intestinal diet. I/D dog food is a highly digestible formula created specifically to help manage dogs with GI disorders such as colitis, constipation, diarrhea, gastroenteritis and pancreatitis. Once the pancreatic flare up is under control, then it's important to feed a low fat, high fiber diet for life. We recommend Hill's W/D diet for dogs that aren't excessively overweight and Hill's R/D (Reducing diet) for those pets more than 10% overweight. We in the profession have no idea why the pancreas don't always work well. We know it can be a genetic problem. We see this problem in German Shepherds, for example. We know it can be a result of having pancreatitis leading to scar tissue within the pancreas. But other than that, we don't know much about the underlying cause of this problem. Because dogs with inadequate digestive enzymes don't digest food well, symptoms include poorly digested stools and weight loss. Treatment is pretty simple but unfortunately somewhat expensive; we simply add pancreatic enzymes to your pet's diet. Supplemental pancreatic enzymes come in flavored tablets or powders. Cost is about $20-50 a month depending on the size of your dog. Vitamin deficiencies are common with this disease, so adding a multi-vitamin is also important as are B-12 injections once a month. It's tempting to give thin dogs high calorie diets but we have to be careful not to throw these patients into pancreatitis. So once again we recommend Hill's I/D or W/D diet. But the most important part of the treatment is the addition of Pancreatic enzymes. Most dogs respond quickly and regain their weight and body condition in about 1 month. Pancreazyme Chewable Tablets: Recommended for short periods for many different types of digestive disorders including pancreatic flare ups and recommended for long term for pancreatic insufficiency. DigestRite: A combination of pancreatic enzymes and probiotics to aid in digestion. Great for pets with excessive gas, irritated bowels, reflux problems, poor digestion, pancreatitis, and pancreatic insufficiency. FoxNest Multivitamins: chewable and contains all the vitamins that are needed in dogs with pancreatic insufficiency. 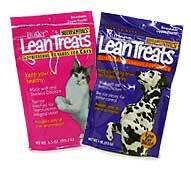 Lean Treats: Skinless chicken, low fat treats that dogs love suitable for dogs with pancreatitis. Pancreatitis is a common problem in dogs ... and the main treatment is nutritional. This was my original web site where I wrote down just about everything I knew about treating different diseases, about the history of veterinary medicine, and many related subjects.